The search for historical trees and ancient woodland in Cambridgeshire has been given a boost by experts using maps dating back to the 1840s. 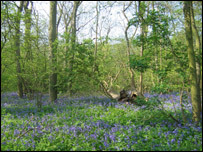 Many ancient woodlands across the county have disappeared under housing developments, roads and railways. Overlaying maps on existing landscapes reveals remains of towns, villages and countryside features from 1843 to 1893. The Ancient Tree Hunt aims to record at least 100,000 surviving old trees throughout the UK by 2011. One of Cambridgeshire's oldest trees is near Witcham, just off the A142 to the west of Ely. This veteran ash tree with a 2.1metre (7ft 8in) girth may have been part of a hedge in its early life. It stands on the edge of the Bury Road as a reminder of an ancient boundary. "The maps are helping us identify some of the best places to search for remaining ancient trees," Nikki Williams, project manager for the Ancient Tree Hunt, said. "People joining the Ancient Tree Hunt can step back in time to see former landscapes of parks, gardens and tree-lined avenues. "These are strong clues to find surviving ancient trees as well as a fascinating glimpse of local history." "The old maps show us exactly where larger concentrations of trees once stood," she added.